A dual action supplement for both short and long term joint maintenance, MaxaFlex employs the latest patented technology Green Lipped Mussel extract SuPerna™ with added Glucosamine, MSM and HA. After less than 7-10 days, the clear results are visible. 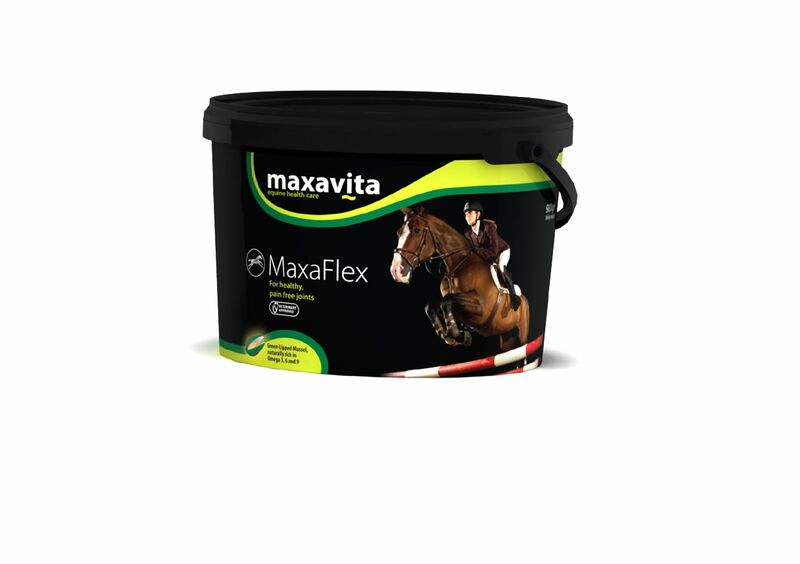 Containing no banned substances, MaxaFlex is veterinary approved and clears all FEI regulations for competing. Below are some recent questions we've received regarding Maxavita Maxaflex for Horses, including answers from our team. My horse is allergic to wheat. Is there any wheatfeed in maxaflex? The ingredients provided by the manufacturer do not suggest that Maxaflex contains any wheatfeed. It does contain Alfalfa but this should be ok. The daily recommended dose is 30g but my newly arrived pot contains a 50ml scoop which seems slightly strange. So, how do I correlate the 30g dose with the 50 ml scoop please? The scoop has a volume of 50mls, so it is correctly labelled. 50mls of this product weigh approximately 30g, hence the scoop is correct for the daily recommended amount. Can I feed glucosamine along side maxaflex or will it be over the recommended daily allowanc? There is no fixed dose of glucosamine and some people do believe that within reason, the more you give, the more effect it will have. This has not been scientifically established, so nobody can say either way with any real certainty in fact. I cannot be sure that you will notice any additional improvement, but you might do and it would be safe to try as you suggest. I'm enquiring to see if your product maxaflex is suitable for Laminitics, mainly as it contains glucosamine? There is no easy answer to this. I would expect the glucosamine to marginally increase the chances of laminitis occurring in an individual prone to this, but it could provide benefits for the joints. Your decision would depend on which consideration seems the most important. You and your vet will have to decide which aspect is regarded as the most important. I have been recommended to use Maxavita Joint Supplement by my vet. I note that there is Alfalfa in the ingredients. Do you know how much is contained in say one pot/per measure please? I believe that just slightly over half of the product (by weight) is Alfalfa. How long would a pot of this last for my 15.2 horse? The recommended feeding amount is 30g per day, which would make a 900g tub last for approximately 30 days.